Posted on Fri 27 Jul 2012 at 3:02 PM PST. Filed under Collage. I haven’t shot any art videos lately (although I will be buying the Canon M mirrorless camera that was just announced), but my collage work is flourishing. In the three months that I do collages now, I got better results, artistic maturation, and public recognition than I had in the 5 years that I did videos. I feel like I have a real shot in the specific sub-genre of collage: the highly narrative type that is, where the artwork feels like a still frame of a longer, surreal B-movie. If all I’m supposed to get is a single frame out of all my sci-fi movie ideas, it’s still better than no realization of them at all. I’ll leave the rest of the plot to the viewer’s imagination. I’ve made 75 collages so far, of which 32 of them are commercial, but they’re all under the various Creative Commons licenses, and their high-res versions can be found on FlickR. I personally consider about 25 of these works to be “good enough”. For the rest, I’d prefer it if they didn’t exist at all. Most of the stuff I do lately are vastly better than the ones I did in the beginning, although my four John Maus collages I did early in the process are still among my best. I think that the guy inspires me so much that even when I didn’t know what I was doing back then, the collages of him were still coming out pretty nice. On my online shop, I believe that this is my best stationery card design, my best iPod/iPhone case/skin design, and finally, my best t-shirt design. Still, I have a long way ahead before I become as good as Cur3es (if ever). On the video side of things, getting involved with collage has helped me see visual arts with a different eye, so whatever video I might do in the future, it will be much different (and more weird) than anything I’ve done so far. 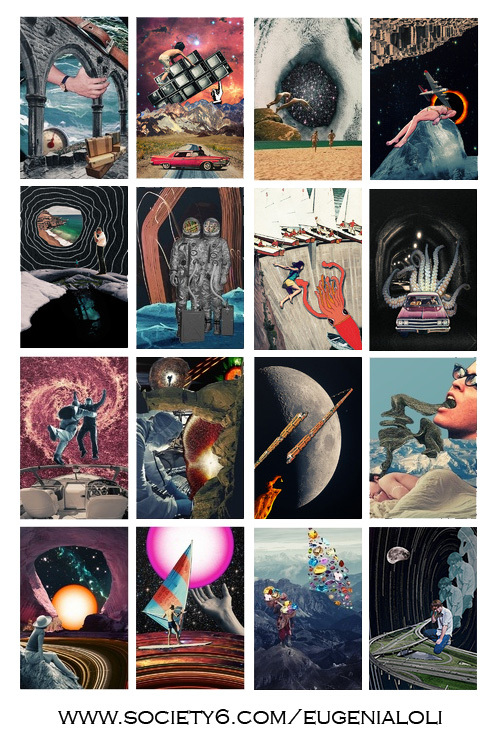 I really like your works and am even considering buying some (have no access to a big printer ;). Just a small concern–your latest works becoming a bit predictable–i’m following you on twitter and even lately I kinda know what to expect even before opening a link to your newest collage: there will be a car, rocks/cliffs, space and 1-2 humans displayed. Even the color gamma follows the same pattern–purple/black/red + some “different” one e.g. red or light-blue or white or silver. Of course you decide what and how to be displayed, yet for me personally it becomes a bit repetitive, collages start to feel more “programmed”, as if they were created using an algorithm by your software. Please don’t take it as a complain, I still like them, it’s just that for me the more of variety could help to discover other sides of your talent and personality. Thanks. So far, car vintage images with people are the only good ones I can get my hands on (CC-BY modern pics of people look terrible), so I do with what I can get by. The colors on old pics also have a special tint, I don’t grade them much. Finally, I like space as a background, I find it varying, although more experimentation will occur soon. Do not expect me do abstract collage though, it’s not me. Most of my collages feel like a still frame of a B-movie, that’s my goal on most of them. Some elements might re-occur on some collages (especially the cars, since I happen to have an abundance of such pics for now), but I don’t agree that they’re all the same. Most of my collages have a meaning behind them btw. Glad to read you are going to make more videos, your video tutorials is what brought me to this blog in the first place. Why are you so sure the new Cannon mirrorless will be worth buying? It might be terrible… Will it be better than the NEX-7 or the GH-2? No articulating screen is one major negative. Was just wondering what you saw in it. I will wait for reviews first, obviously. I never buy before I learn more. The articulating screen on the T4i is nice, but the M is smaller. I’m willing to trade one for the other. The rest between the two cameras are the same, video-wise.